Each control in this library has designed to be flexible and eye catchy in their look. First of all, they support border shapes other than standard rectangle as rounded, circle of chamfered. Their backgrounds can be filled with advanced gradient colors. Images you have associated with controls can be drawn in AlphaBlended form. Texts in the controls can be drawn with advanced effects such as DropShadows. All these advanced drawings can also be customized for different states of the controls such as hover, focus and soon. Managable styles of controls allows you to change your applications look whenever you want with ease. Each control supports built-in Office2007 and Office2003 color schemes but anytime you can surpass this and use your own created styles easily thanks to StyleManagement feature of Klik! Windows Forms Library. Furthermore, there are 7 ready to use styles incuded with the package which you can reach use Quick Access Menu associated with every control/component and are named as Office 2007, Office2003, CoolBlue, SoftXP, IceBlue, BurningRed and LiveGreen. The Icons included in the package helps you to complete your screens with the fine blend of images provided within the pack. More than 220 unique icons with different forms of size and formats, you won't ever need to buy a separate icon package anymore. Klik! ListLib.Net : Klik! ListLib.Net is the individual product which consists of special components aiming to provide advanced list/grid functionality to your applications. Klik! EntryLib.Net : Klik! 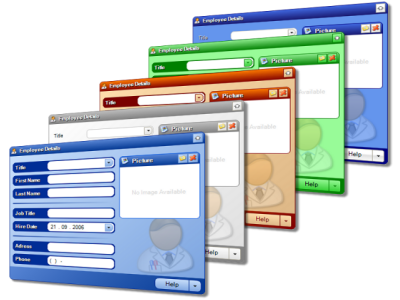 EntryLib.Net contains different kind of data entry/input controls for creating data entry screens. Klik! NavigationLib.Net : Klik! NavigationLib.Net contains advanced navigation components such as treeview, wizard and more. Klik! DesignerLib.Net : Klik! DeisgnerLib.Net adds screen design capability to your applications similar to Visual Studio Windows Forms designer. Klik! StylerLib.Net : Klik! StylerLib.Net allows you to easily style your forms no matter they are built in .Net controls or any 3rd party for an appealing look. Klik! DockLib.Net : Klik! DockLib.Net adds window docking and pinning functionality to your screens. Klik! SizeLib.Net : Klik! 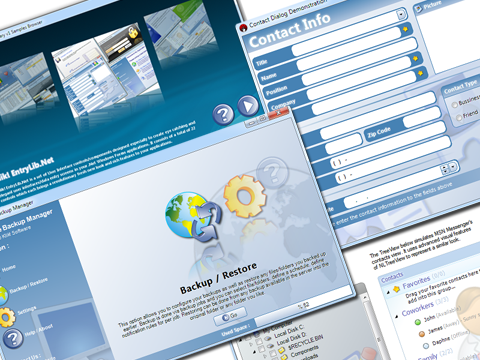 SizeLib.Net adds resizing ability to your forms to provide resolution independency. Klik! IconPack : Klik! IconPack provides 220 unique icons to decorate your screens. Each component/control in this library is fully loaded with advanced features which either introduces a new behavior or improves significantly over the ones you find in regular .Net Framework components/controls. Apart the state of the art look, you get full set of features to ease your daily tasks with little or no need of code. It's connected architecture also allows you to combine different pieces together to create the most appropriate solution for your needs. Klik! Windows Forms Library dlls are offered in 2 forms which each targets different .Net framework versions as v2.0 and v3.X. 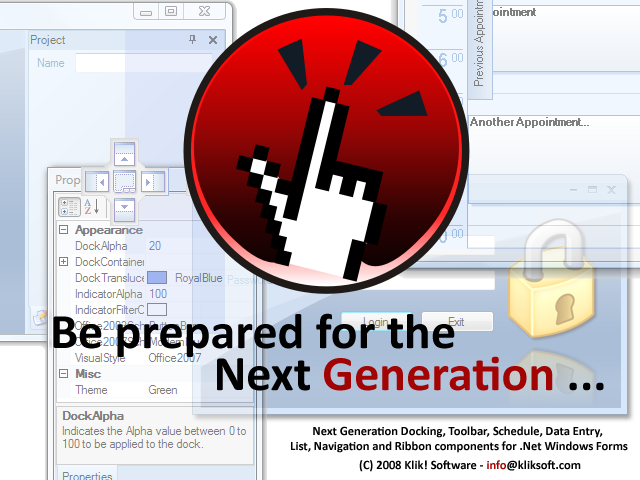 All the dlls are specially optimized for their targeted .Net versions as well.